Congratulations to Perry Meridian High School senior Caitlyn Moore, pictured in center, for winning an Abe Lincoln Award scholarship sponsored by the Kiwanis Club of Indianapolis. She received the first place award, a $16,000 scholarship. 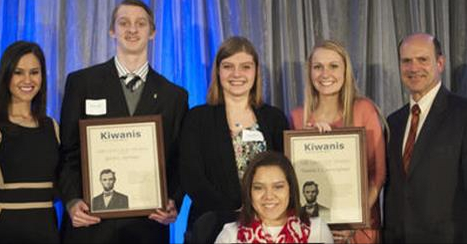 In its 100th year, the Kiwanis Club of (Downtown) Indianapolis honored 25 high school seniors who have overcome significant obstacles in their lives. Circle of Valor awards were presented to the 25 candidates including Moore from Perry Meridian and Kaileigh Thomas from Southport High School. Each candidate was nominated by his or her high schools for the scholarships because of their courageous achievements in the face of daunting obstacles and hardships. “These awards celebrate the perseverance and spirit, as well as the achievements, of young people overcoming extreme obstacles, some seemingly insurmountable,” explained Steve Willem chair of the Abe Lincoln Scholarship Awards.